Charlie Blackwell was born in Seattle, Washington, on 11 May, 1921. As a child he was trained as a classical pianist, but he soon became interested in jazz and by fourteen had his own quartet. Following a car accident in which both his legs were broken, he began to play drums and percussion as part of his recovery therapy. During his twenties, Blackwell worked as a drummer with Stan Kenton, Dave Brubeck, and other bands, and also started to develop his own singing style, eventually becoming a popular singer in clubs throughout the western states of the USA. He was still performing his lounge act in the mid-1970s. Original pressings of the LP "Elvis Is Back" listed (Beverly) Ross and (Sam) Bobrick in the songwriter credits, whereas Blackwell's recording shows Ross and Barry. To add to the confusion, some later issues of Elvis's version list Bobrick and (Ross) Butler. The song remains the same. 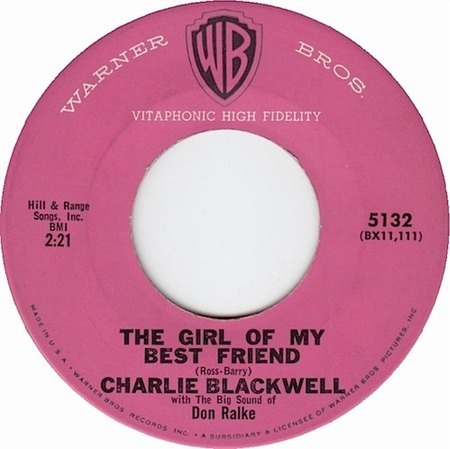 Charlie Blackwell's original recording of "The Girl Of My Best Friend" was his fourth single release on the Warner Bros. label, number 5132, with performers listed as Charlie Blackwell with The Big Sound of Don Ralke. The release was reviewed in the Billboard issue of 30 Novemebr 1959, when the A-side was indicated as "Choppin' Mountains."